Meeting Place: Meetings are held at the Masonic Hall, Wanliss Street, Rockingham, on the first and third Fridays of the month. For Group Studies meetings, please contact Group Leaders listed in program below. On Friday 29 March members of Rockingham and Districts had an outing to Optus Stadium. 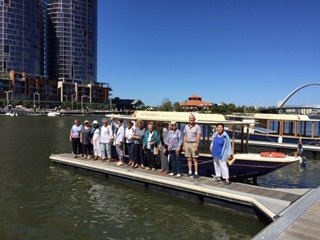 The day began with a coffee at Elizabeth Quay before boarding a small electric ferry for a short cruise to the stadium. Along the way our skipper pointed out places of interest and some of their history. The weather was almost perfect and as there was no sound from the engines our trip was very peaceful and calm. Approaching Optus Stadium we sailed under the Matagarup Bridge which provides pedestrian access across the river to the stadium. The bridge’s structural shape which could be two flying swans, complete with wishbones, a Wagyl serpent or a ribbon, and the striking black and white colour is such an impressive sight. The stadium situated on the banks of the river and surrounded by beautiful walks and garden is also quite stunning. Walking around the stadium on the tour we discovered the state of the art sporting and high tech facilities. Players and staff, patrons and broadcasters, had all been considered in the design of the stadium. 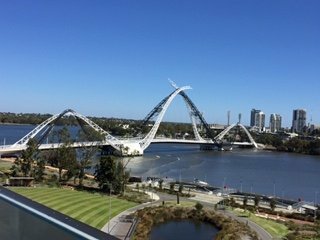 It was such an enjoyable experience being able to see all the behind the scenes features as well as have breathtaking views of both the Swan River and city from the highest part of the stadium.